The first time I heard about Kefir health benefits was after a stomach bug had worked it’s way through my family. I was the last to get it and also the hardest hit. I guess the exhaustion of being up every night changing sheets for the rest of the family made my immune system a little weak. So there we were all looking a little washed out like limp rags when my friend suggested Kefir (pronounced keefuhr) to replenish the good bacteria and restore our inner ecosystem. Did you even know that you have an inner ecosystem? Did you know that it can be thrown out of balance when taking certain medications such as antibiotics? One of the main Kefir health benefits is restoring beneficial flora to the digestive system and thereby bringing balance to your inner ecosystem. Kefir has been around since the beginning of recorded history and is thought to have originated with the Caucasus people. Much like yogurt, Kefir is a fermented milk beverage, but it can be made with dairy or non-dairy milks. The name Kefir comes from the water-soluble polysaccharide known as kefiran, which imparts a rope-like texture and feeling in the mouth. The milk becomes a cultured, enzyme-rich food and can be taken as a natural probiotic which is beneficial to your digestive system. So I was thinking, well can’t I just get a lot of yogurt and achieve the same thing? Apparently not, fermented food gurus swear that Kefir is far better than yogurt. Kefir has more bacteria and once it finds a place to live in your gut, it builds colonies of good bacteria that get on with keeping you healthy. Traditionally kefir is prepared by fermenting the milk with the grains. My dear friend delivered my kefir grains starter pack and I got fermenting. The ‘grains’ are actually not grains as in cereal grains, they are grains grown from fermentation and resemble cauliflower florets. So you need a starter community of grains which you can buy from a health shop or online or get from another kefir fermenter. I filled a quart glass jar with milk (raw and organic), about 2/3rds of the way and then added the kefir grains. I closed the jar with a lid but you can also use plastic wrap too. Then it sat on the shelf for about a day or so until the milk had gone thick and looked like yogurt. I strained it through a non-metal strainer but a slotted spoon would work too. The kefir liquid is what you consume and the leftover grains are for using to make the next batch of kefir milk. Kefir milk can be stored in the fridge. Do not expose the jar to direct sunlight as direct heat will destroy it. Never touch the kefir with metal, only plastic or glass. 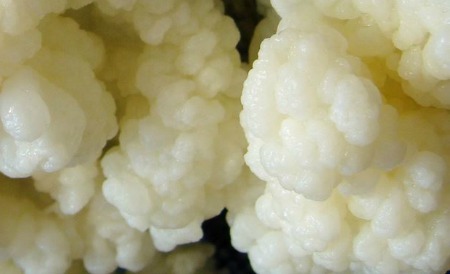 If properly cared for the kefir grains will outlive you. I took to Kefir milk right away and had no trouble digesting it despite my slight lactose intolerance. The fermentation process removes about 50% of the lactose present in the milk. Some people find they have to build up a tolerance to it by starting out only drinking about 100 ml on an empty stomach and then increasing that every second day until they can drink a whole 250ml (cup).